Actor Vikram recalls the moment when he along with Ravanan’s director Mani Ratnam and Suhasini Mani Ratnam took the centre stage soon after the screening of the film at the Venice Film Festival recently. The audience, about 600-700 people, gave thundering applause to the trio, he said. Vikram revealed that they had intended to stay on for the screening till the Usure Poguthey song as they were scared of the reaction the film would garner, but realized that the audiences were engrossed in the film so that they decided on staying till the last. 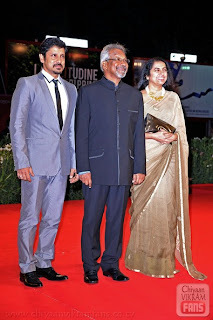 It may be recalled that Mani Ratnam was honored with the Jaeger-LeCoultre Glory to the Filmmaker Award during this event.